Clear Choice Hearing Center is the very best choice in The Woodlands, TX for hearing aids and hearing tests. With our state-of-the-art technology, hearing and speech understanding is better than ever by treating your hearing loss with our high definition and precision hearing testing which includes an in depth and explained evaluation and welcomed demonstration for qualified candidates. Schedule your appointment now by calling 281-772-4920 and rediscover what your should be hearing and understanding. Clear Choice Hearing Center are the experts in The Woodlands area at providing thorough hearing examinations utilizing state of the art technology. 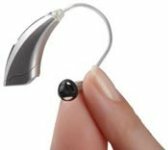 Clear Choice Hearing Center has earned the distinction of achieving remarkable results with our custom fit hearing aids that are based on precise, thorough hearing tests. That's why we are clearly the best choice for your hearing health care whether it's for a comprehensive hearing test and evaluation or to be custom fitted with hearing aids! Dr. McCabe at Clear Choice Hearing Center is very compassionate and truly wants to improve his clients’ lives by providing them the opportunity to hear better than they could have imagined. His patience and passion for his work were abundantly clear when he spent a great deal of time with my son at his initial visit, making sure everything with the hearing aids was just right. He also spent time explaining how the technology works to make sure my son would get the most out of his hearing aids. Excellent experience all around.